• How can I cite KLIFS in a publication? KLIFS was published in the ACS Journal of Medicinal Chemistry, please check their website for the most up to date citation information: ACS Journal of Medicinal Chemistry. • When can we expect a searchable web interface for KLIFS/KLIFS v2.0? We initially planned to have the website up and running in the second half of 2014, but unfortunately we encountered some difficulties. In the meantime we have found a solution to properly host the KLIFS website and the KLIFS v2 web interface with integrated search engine will be up and running next week with weekly updates as of that moment. • Where can I download the master sequence alignment? The master sequence alignment has been optimized for the correct alignment of the 85 pocket residues. Therefore, it is not suitable to be applied in a different setting. However, for a good overall alignment of kinases, we recommend using the kinase alignment of Manning et al., which is freely available at kinase.com (link). • When did you download the current snapshot from the PDB? 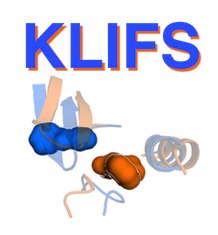 KLIFS v1.0 was created based on the in the PDB available crystal structures at 09 August 2012. • I cannot find a specific crystal structure in KLIFS that is present in the PDB, what happened and can you add it? Please make sure that the PDB structure was not released before the PDB update of this version of KLIFS (see the answer to the previous question) and that it contains a human kinase (i.e. KLIFS does not contain non-human orthologues). We might have missed the structure if the Uniprot identifier used in the PDB entry was not in our list for a certain kinase. Please send us the information regarding this structure and we will make sure to add the structure for the next version of KLIFS (see contact information below). Please send us all information regarding the error and we will correct it in the next version of KLIFS (see contact information below). Please contact us with your ideas for the improvement of KLIFS (see contact information below). Please contact Chris de Graaf (see his website) regarding any inquiries you might have regarding KLIFS.